The Divje Babe flute, discovered in a cave in Slovenia in 1995, has long been heralded as the oldest musical instrument ever discovered. The item is a fragment of the femur of a cave bear which had been pierced with evenly-spaced and perfectly-formed holes, dated to between 60,000-43,000 years old. The age of the relic radically suggested that Neanderthals were crafting flutes prior to the emergence of Homo sapiens in the region. For some scientists, this conclusion was just too much to swallow. A new study claims the ancient artifact is nothing more than a bone that had been chewed on by hyenas. The Divje Babe archaeological site is located in a cave 230m above the Idrijca River, near Cerkno. Researchers working at this site have uncovered more than 600 archaeological finds in at least ten levels, including 20 hearths with evidence of habitation by Neanderthals about 55,000 years ago. They have also found the skeletal remains of numerous cave bears. 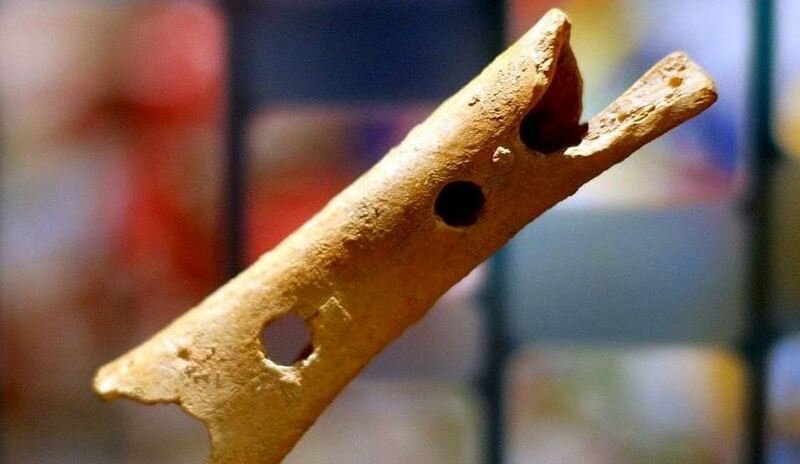 In 2008, another discovery was made – a bone flute in the Hohle Fels cave near Ulm in Germany dating back 43,000 years. The five-holed flute has a V-shaped mouthpiece and is made from a vulture wing bone. It was one of several similar instruments found in the area, with others dating back to 35,000 years ago and made from mammoth ivory. The mammoth-ivory flutes would have been especially challenging to make. Using only stone tools, the flute maker would have had to split a section of curved ivory along its natural grain. The two halves would then have been hollowed out, carved, and fitted together with an airtight seal. The cave in southern Germany contains early evidence for the occupation of early Homo sapiens and on announcing the discovery, scientists suggested that the "finds demonstrate the presence of a well-established musical tradition at the time when modern humans colonized Europe". In the academic field, a flute made by early humans was much easier to accept than a flute made by Neanderthals, who had long been viewed as inferior to Homo sapiens and nothing more than subhuman brutes – a view that is now largely dismissed. Nevertheless, there still remains a minority of scientists who do not accept the possibility that Neanderthals were playing music and have claimed instead that the perfectly spaced and neatly carved holes are in fact the result of the bone fragment having been chewed on by an animal – a little hard to believe after watching this video showing the music produced by the reconstructed flute. In a paper published in the Royal Society of Open Science , Dr Cajus Diedrich from the Paleo-Logic Independent Institute of Geosciences took a look at several musical instruments that had been attributed to Neanderthals. Dr Diedrich said analysis of the bone shows the holes are teeth marks, and the shape is just the result of the bone not breaking when it was chewed. “The research suggests historians have been fooled by these phoney objects - and, in fact, all such ‘instruments’ attributed to Neanderthals are simply chew toys of animals,” reports the Mail Online . Dr Diedrich had dismissed all the research that has been conducted on flute bones so far. However, in recent years the consensus that the Divje Babe flute is an authentic musical instrument has been growing as the view of Neanderthals has changed from subhuman brutes to more sophisticated humans. can someone give this scientist bones gnawed by hyenas??? cause im pretty sure he haven't seen one. I had to read this article and its associated links twice as I was sure it was a JOKE! Turns out its not a joke which is astounding to say the least. The good doctor has summarily dismissed out of hand all evidence of Neanderthals making flutes. Excuse me but what kind of scientist just summarily dismisses all previous evidence because it does not support his/her little “pet theory”? This is just one more attempt to degrade our ancient human ancestors because, in fact, we are suppose to believe they were “bruts” and ignorant barbarians. Yet, I highly suspect just the OPPOSITE is true! Neanderthals had culture so why would they not make such flutes? I think the good doctor needs to return to college and this time pay attention especially to subjects like “Researth Methods.” There is absolutely NOTHING in association with this flute that indicates it is only mere knawings of a hyena or any other animal. Everything about it indicates “human made.” It’s this kind of so called “research” that I deem JUNK science because that is exactly what this article is about...JUNK SCIENCE!! "Dr.Diedrich is an idiot. By his logic, Africa should be filled by flute and similar instruments - ''made'' of hyena bites..."